Zhunti (Sanskrit Cundi: “Extreme Purity”; Japanese Juntei) is a bodhisattva venerated particularly in the Esoteric or Thunderbolt (Vajrayana) Buddhist school. She is known as a bhagavati, or “mother of buddhas”, and is often equated with the bodhisattva Avalokitesvara, Guanyin in China, who hears the cries of sentient beings, and who works tirelessly to help those who call upon her name. The recitation of her dharani is found everywhere among laymen and contemplatives throughout the Sinosphere and in the Tibetan tradition. 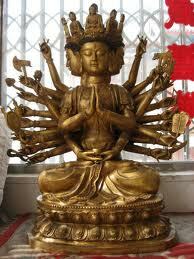 Zhunti’s eighteen arms wield implements symbolising the skillful means (upayas) of the Dharma. The mantra is usually heard in a heavy Chinese pronunciation of the original Sanskrit, as per the recordings and transcriptions below. For more information, follow these links to a specialised article or to a dedicated site.